Oak veneer doors have a more consistent wood grain look when compared to solid wood options which boast a completely natural wood grain appearance and are long lasting as well as extremely sturdy. However, whichever option you choose, both types of doors will need to be treated initially to enhance their finish and protect them from the elements. A selection of experienced and knowledgeable Devon joiners are on hand to ensure your doors look their best and will stand the test of time for many years to come. If your home is bustling with life, albeit from children, loud music or films blaring out, you may well benefit from a bit of help where noise is concerned. This is where effective sound proofing really helps and where solid oak doors really work wonders. Solid wood is excellent for soundproofing a property but if sound levels aren't a major concern in your Devon home, oak veneer will likely do the job to the most part. "You can choose from a large range of materials for your door depending on the time period of your home." While oak veneer doors will do an adequate job of keeping your home energy efficient, solid wooden doors will make a substantial difference to your energy consumption, keeping the heat in and acting as fantastic insulators. 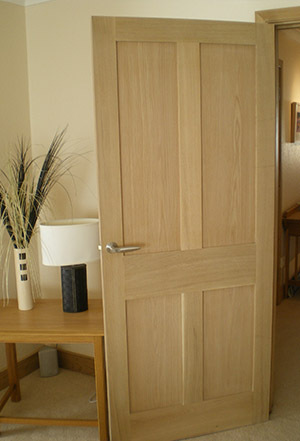 As well as actively reducing your impact on the environment and saving money on your energy bills, well-constructed solid oak doors, handcrafted by local, Devon joiners will have a big impact on the efficiency of your home overall. In many instances, the choice of door you opt for is determined by the overall style of your home. While modern homes provide a wider scope for the choice of doors available to you, be it a solid oak door or veneer option, older and more traditional homes are more often suited to solid wood options to a beautifully authentic look. That said; oak veneer does an excellent job of looking like the real deal although solid wood provides a real statement feature within your home which cannot be rivalled. "Innovative door designs of uncompromising quality"